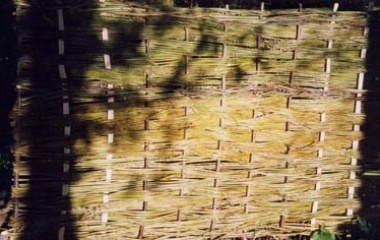 Wattle (woven) Hurdles are panels made with either single cleft (split) hazel rods, or with bunches of willow. 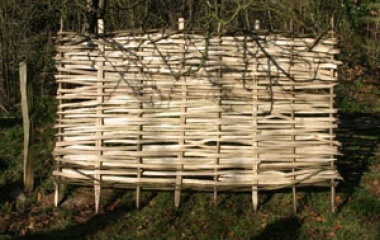 Both Split Hazel Hurdles and Willow Hurdles are supplied untreated and have equal durability, lasting approximately the same length of time. There is therefore very little difference between them beyond personal preference. We grow and harvest our hazel and willow organically here at Bore Place. However if we cannot source enough of our own material, we will bring up willow from the withy beds in Somerset and Devon, and hazel we coppice from elsewhere in the south east of England. 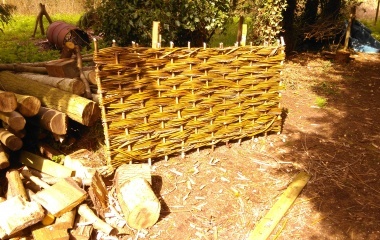 We are members of the Sussex and Surrey Coppice Group and all our hazel and willow is harvested sustainably. The panels can be supplied for you to install yourself, or we can install them for you. Generally they are installed on chestnut stakes, but can equally be attached to walls or other solid uprights. These are all standard sizes, but I also make to measure – please contact me with your dimensions and I will provide a cost. I generally start cutting hazel after leaf fall, and then start making orders from December until all the materials have been used. I don’t cut in the summer, or use summer-cut wood for several reasons. Firstly (and most importantly), cutting rods in summer is much more intrusive to wildlife as nesting and plant growth is in full swing. In winter, wildlife and wild plants are dormant. The coppice itself also grows better and more productively if cut in the winter. I actively manage woodland, and restore ancient coppice, to improve the quality and viability of the wood. Improving the quantity and quality of the coppice also improves the quality and diversity of wildlife that can inhabit it. Finally, the coppice wood is full of sap in summer – so is very wet and heavy to work with, and due to the higher sugar content, may well be quicker to rot. As hurdles are sometimes large and bulky, I do need to charge for delivery. Please also note that I can only deliver locally, and any courier needs to be arranged by customer at their own risk.